The Woods at Royal Court. When you enter, it’s the smell first, then the dark. A bigger space than you’d expect suddenly opens up, and your awareness adjusts, uncomfortably, to fill this blackness with its twisty trees, the bark underfoot. In the centre is a wooden structure, like a joke of a hut, partly covered by a ripped tarpaulin. It’s not comfortable, sitting there in the Jerwood Upstairs; it’s hard, in fact, to remember where you are. The smell of all that bark takes a while to settle in your nostrils. That feels right. Robert Alan Evans’ The Woods brings Lesley Sharp to the Royal Court again in an unnerving performance, and is one of those rare plays where a dialect coach (Hugh O’Shea) is really warranted. As audiences this side of the pond, we’ve become used to the odd ropey Yank accent and can certainly put up with them, but often productions gain very little by putting their actors through the effort of gaining these accents, or trying to. Not so here: the first time Lesley Sharp’s accent as ‘Woman’ shifts in The Woods, it’s a truly disarming moment. Accents are used in this play to great, creepy effect: when Sharp initially speaks, it almost sounds like gibberish, the sounds made by someone who hasn’t had to be understood for a very long time. In the broadest Southern American accent, she literally seems to roll the words around her mouth. At first, with sharp, brief scenes like quick film cuts (thanks to Anthony Arblaster’s lighting design), nothing feels safe or certain at all. The Woods doesn’t make conventional sense, but a kind of sense you feel intuitively. The Woman has been in the woods for a long time, living in the hut, eking out an existence of sorts – a haunted one. She’s haunted in particular by the Wolf, played by Tom Mothersdale, an actor completely in control of himself with horrible intent. A boy (Finn Bennett) appears in the woods, and the Woman expands her circle of concern to include him. The Wolf wants him. Or does it want her? Lucy Morrison’s production is grim, constantly breaking away from any grip you feel you might have on it, which suits Evans’ play well. Evans’ language is often beautiful, giving both Sharp and Mothersdale speeches which seem to tumble out from them irresistibly: the Wolf warns that he’ll see the Woman again “in the next encounter” and we feel everything loaded in that phrasing. As a kid who bullies the Woman in a playground, Charles Furness is strong but perhaps should have been given more of a chance or cut completely: otherwise, the play is a very lean beast. Tom Gibbons’ sound design is astonishing again: at the beginning, as we’re filing into this strange setting, we hear muffled voices and folksy music, as if from far away, but more than anything an angry rustling of branches, like the sea. At other points there’s strings and tinkling punctuated by dark bass hits or more industrial stretches, a perfect storm with Naomi Dawson’s heavy-scented design. The set has surprises for you, which I won’t ruin, but they feel a bit like dreams in which you lose your teeth: you wake up and realise you haven’t, but the sensation is still there with you. 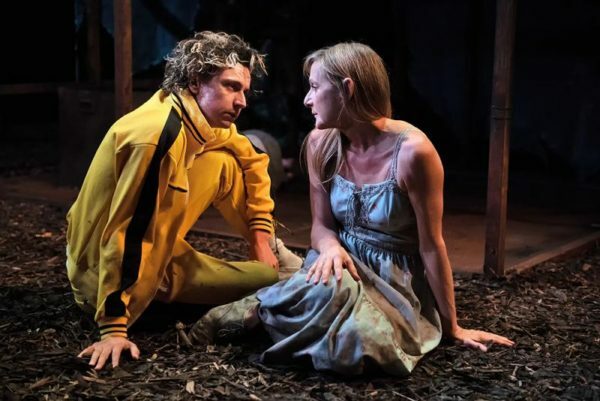 The costuming, too, is impeccable: the Woman wears a dirty, long blue nightie and you feel how cold she must be, particularly after giving up her jacket to the Boy, while the Wolf’s black and yellow tracksuit is echoed menacingly in the disguises he dons to fool the Woman as she tries to ‘escape’, as well as in Mothersdale’s grown-out, dark roots against his bleached hair. Even as he changes his clothes and his accent, his threat is written into every part of him. And exactly what threat he is isn’t entirely cleared up by the end of the play; it doesn’t need to be. The Woods works by showing you exactly as much as the Woman sees, feels and remembers, and the result is heartbreaking. The characters are terrified, and much of this review is written in the second person partly because it should really be witnessed or read in Evans’ excellent script rather than read by summary, and partly because I want you to feel that I was terrified, too. The Woods is on until 20 October 2018 at the Royal Court. Click here for more details.